Earlier in the week dad was telling me about a dish he remembered growing up that his friends dad made a lot. All he could remember was it was while and good. We got a whe chicken the other day. I have around 5 dollars or so for it at Aldis. We got a bottle of white wine at County Market . I got Berringers Chenin Blanc. I gave around 6dollars for that. wash your chicken and pull the skin back leaving it in tack rub meat liberally with your choice of seasonings I used a little salt an Italian blend, sage and garlic. Then pull skin back down and rub with same seasoning. 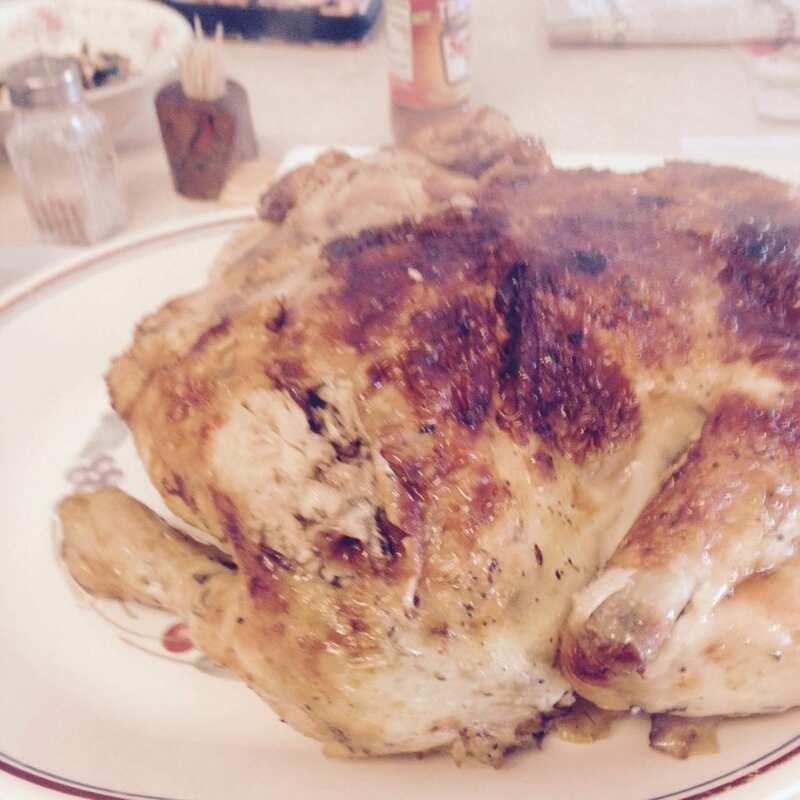 I then brushed with melted butter and roasted 1 hour breast side down. meanwhile, peel and quarter 1 medium potatoe per person into a bowl. Cover with water and salt liberally. Get a crusty loaf of French or garlic bread ready to bake. After Chicken has baked an hour , drain potatoes, push chicken to end of pan add potatoes cook about 30 minutes until potatoes are almost tender now turn chicken breast side up add wine and cook about 30 minutes more take out to set while bread cooks. I served the au jus in a dish. This is an easy meal for a Sunday dinner for 4 or a romantic dinner for two. Do you have a dish that sounds fancy but practically cooks itself? Most of the dishes I make have to practically cook themselves lol. I much appreciate your culinary advice.